There are two versions of the shoes. The MINI spilt shoe is used on lighter duty machines that typically utilize shop vacs for collection. 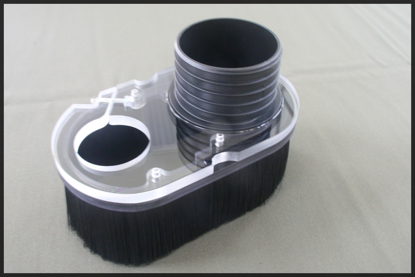 When ordering the mini shoe you will select either a 2" or 3" length brush ring. The 2" ring is most popular for the mini shoe since the smaller machines typically are running shorter bits and have short collets compared to full size machines. The STANDARD split shoe is our original shoe used on full size machines that typically use dust collectors. 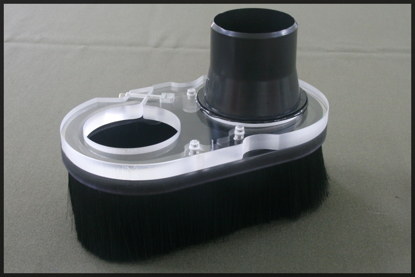 The shoe comes with a 3" length brush ring. While the 3" brush ring works well for most applications, an optional 2" brush ring or spacer rings can be added to cover a wide range of bit lengths.